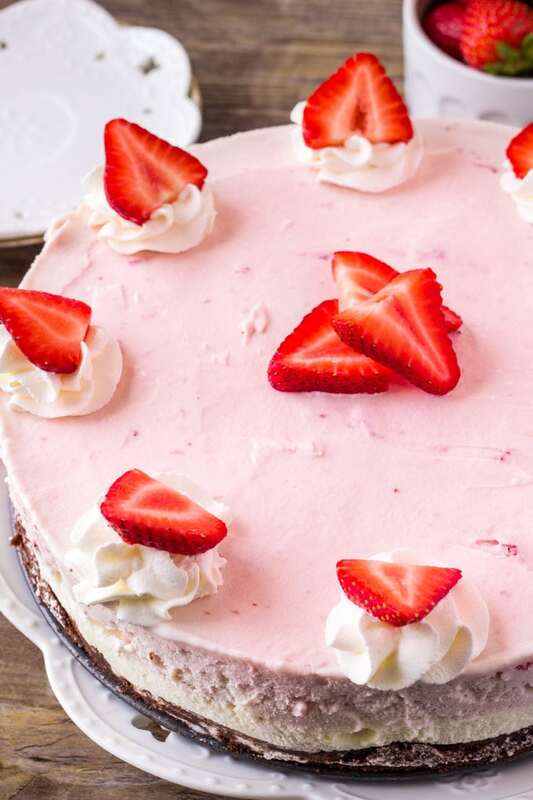 Homemade Strawberry Ice Cream Cake is super easy to make, infinitely customizable, and perfect for all your summer parties. Layers of brownie, two flavors of ice cream & whipped cream topping will have everyone oohing and ahhing! Ice cream cake is probably my favorite summer dessert, and this ice cream cake recipe is my new go-to recipe. It has a fudgy brownie bottom, layers of vanilla and strawberry ice cream, and topped with whipped cream and fresh berries. Because I have a summer birthday, ice cream cake is always what I request for my birthday cake. It’s creamy, it’s cold, it’s chocolate-y, and you get the best of both worlds. Ice cream + cake. But until recently I had never tried making my own ice cream cake. After attempt #1 I was sold. It’s so easy, super customizable, and everyone is always impressed when they hear you made it yourself (even though it’s seriously simple). Make a batch of brownies and bake them in a 9-inch springform pan. I used a box mix for this. Take your vanilla ice cream out of the freezer to soften a bit. Scoop about 16-20 scoops of softened ice cream on top of the cooled brownie and spread flat. Place the cake in the freezer to harden up a bit. Take the strawberry ice cream out of the freezer to soften up. Then scoop the softened strawberry ice cream over top of the vanilla ice cream, and spread flat. (Check out the photo below). Pop it back in the freezer to harden back up. And you’re ready to serve. 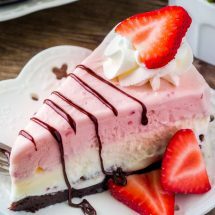 You can customize this ice cream cake recipe with your 2 favorite flavors of ice cream, or just use 1 type of ice cream and make 1 layer that’s twice as thick. I’m pretty fond of this vanilla and strawberry combination though. When you’re ready to serve, take a thin knife and trace around the edges of the pan. Then unclip the springform to release the cake. To cut the cake, use a sharp large knife. I always dip it in a cup of hot water first so that it’s easier to cut through the frozen ice cream. The fudgy brownie bottom, 2 layers of ice cream, and fresh berries make this ice cream cake completely delicious. Plus – you’ll love how simple and easy the recipe is. 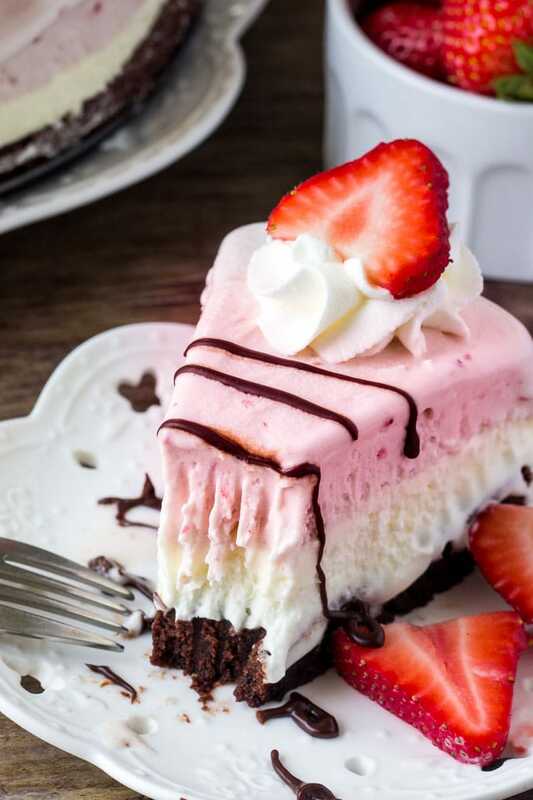 So if you’re looking for the perfect summer dessert for birthdays, BBQs, or potlucks – then this strawberry ice cream cake is definitely for you. Preheat the oven to 350F degrees. Line the bottom of a 9 inch round springform pan with parchment paper. Prepare brownies according to box instructions. Pour the batter into the prepared pan and bake for about 25-30 minutes. (It'll be slightly shorter than the time on the box for an 8-inch x 8-inch or 9-inch x 9-inch square pan). Remove from oven and place on a wire rack to cool fully. Remove the vanilla ice cream from the freezer and allow to soften at room temperature for about 15-20 minutes. Scoop ice cream and place on top of the brownie bottom. Smooth using a flat knife or spatula. Place in the freezer to harden for 1 hour. 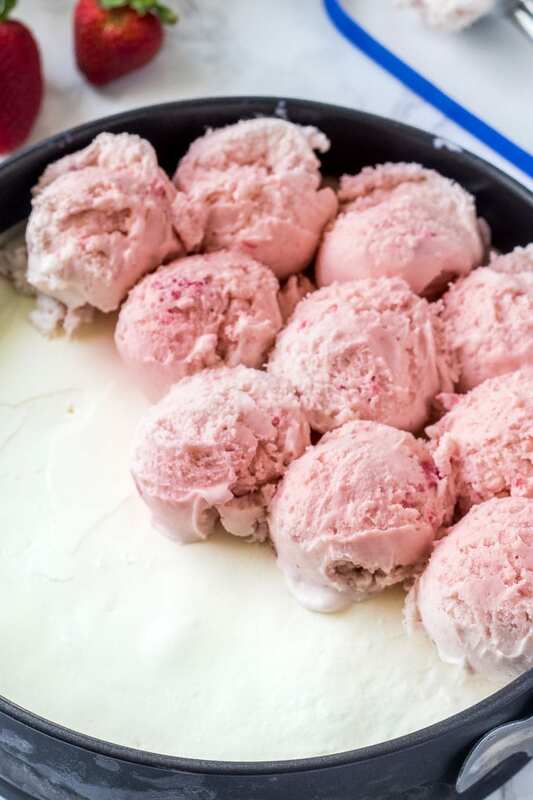 Remove the strawberry ice cream from the freezer and allow to soften for about 15-20 minutes. 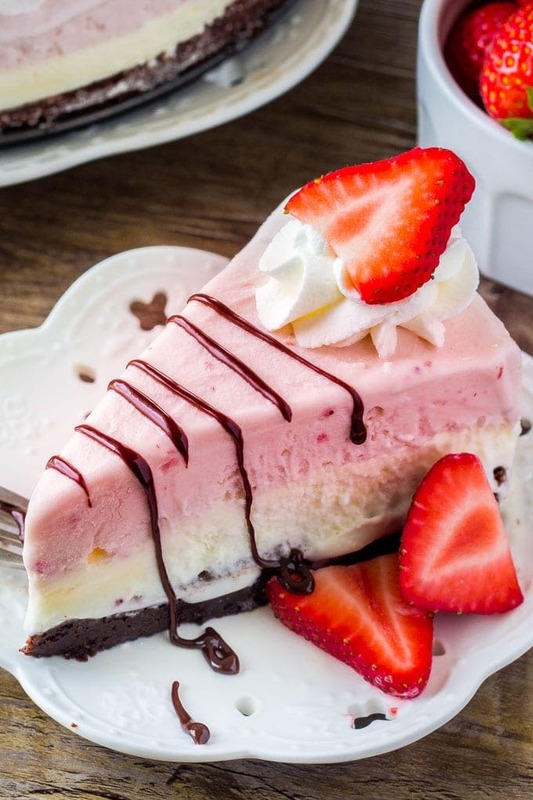 Take the ice cream cake out of the freezer and scoop the strawberry ice cream on top of the vanilla ice cream. Smooth the top flat. Place the cake in the freezer to harden for 2 hours (or longer). To serve, decorate with whipped cream, berries & fudge sauce. *Store leftover cake covered in the freezer. Fiona blogs over at Just So Tasty where she shares easy, classic recipes for desserts & sweet treats. A peanut butter lover, chocolate connoisseur, and sprinkle addict – she hopes to make your life sweeter, one cookie at a time. She also teaches yoga, because life is all about balance. I totally agree that with hot weather like where I live, I would love to eat an ice-cream cake like this than any normal cake! It is really delecious, Fiona!